ARCHLine.XP | Tips - ACE-Hellas S.A.
Did you know that you can find any command in the ARCHLine.XP Toolbox in less than a second? Did you know that you can find any command in the ARCHLine.XP Toolbox in less than a second? You can simply use the Search field at the top of the Toolbox; it will give you quick results and you only need to remember a tiny particle of the name of the command. Click into the Search field at the top of the Toolbox. Type a known part of the command name that you are about to find. Wait for a second and the results will automatically appear. Hover your mouse over a command to see the name and location of that command – you can find the command at that location later at any time. 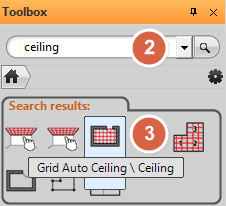 In this example we can see the «Grid Auto Ceiling» command whcch can be found between the «Ceiling» tools. 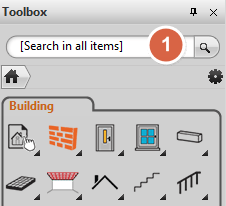 Note: To reset the Toolbox to the default layout, please just press the HOME button below the Search field (it is represented by a miniature black silhouette of a house). 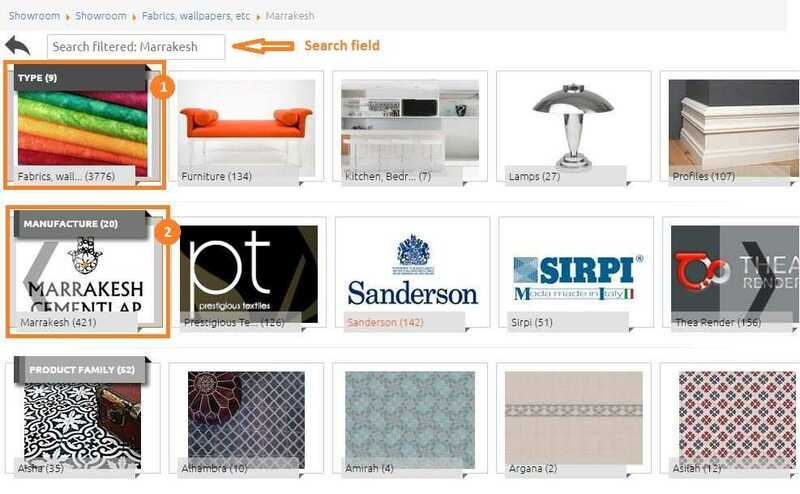 How can you browse the products of the different suppliers in the virtual Showroom of Archline.XP? 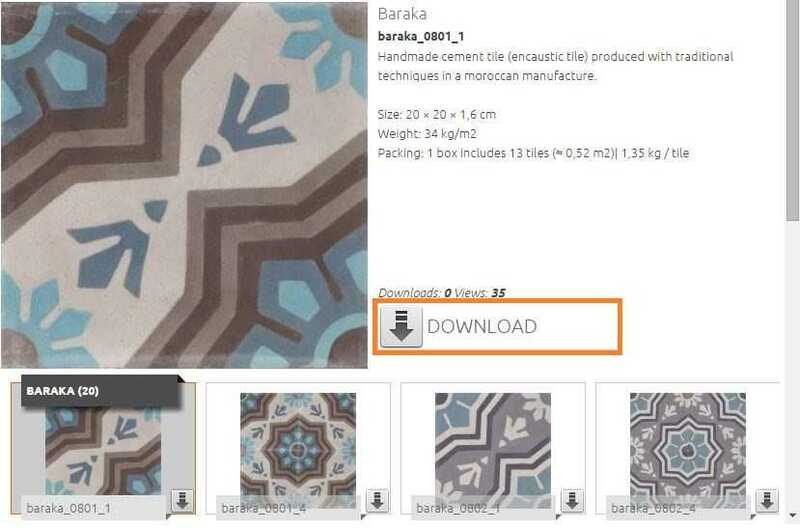 First you need to select the Type (1) of the product you would like to download from the upper line . (Door, fabrics, or furniture etc.). Then select the Name of the Manufacturer (Milora, Kludi, or Ravak etc.) Lastly select the Product family. You also have the possibility to search by product name, you can type the name of the product in the upper Searchbox. 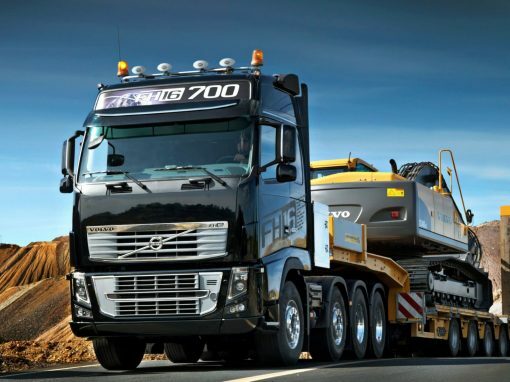 It is also good to know, that you are able to look through a certain type or manufacturer catalog. For example, if you select the Type: „Fabrics, wallpaper” than you can go through them with the word you type in the Searchbar. 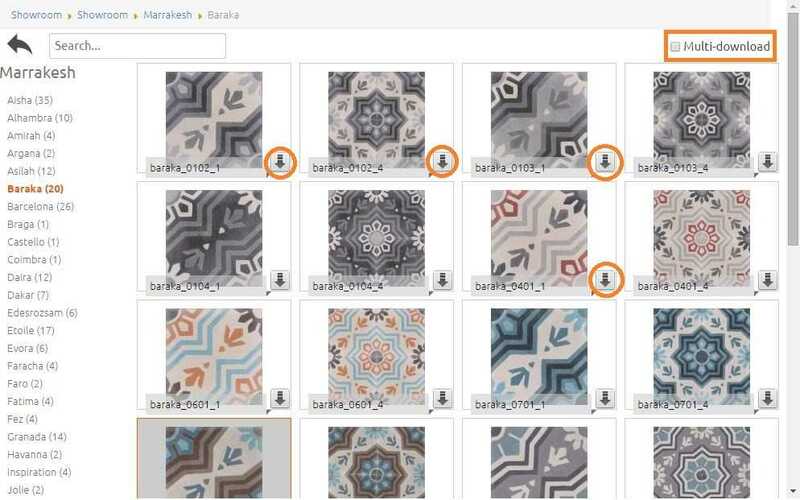 And if you add to the search the Manufacturer: Marrakesh, than you can go through the fabrics of Marrakesh. You can transfer one or multiple products from the chosen product family. If you activate the multiple download option, you can move many selected item without exiting the Showroom, by clicking on the arrow next to the product. By downloading a single item, you can click to check its features, and you can transfer the product at this stage as well. How can you transfer furniture, lamps, materials etc. to another ARCHLine user or copy to an other PC? 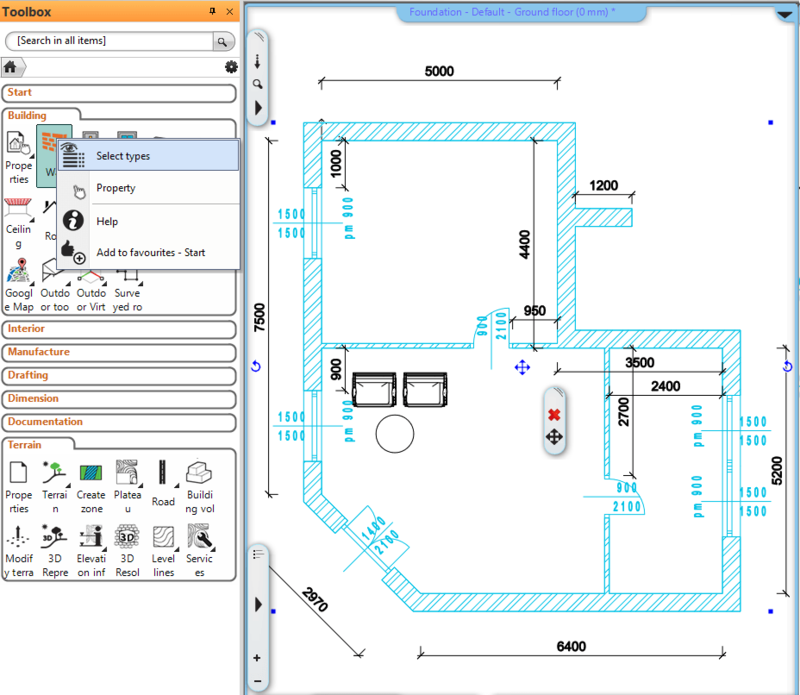 After selection you can export the objects, doors, windows, lamps, materials, groups, and profiles from the Design center to a file called ARCHLine.XP environment. Selecting an item you need to click on it. For multiple selection please activate „multiple selection” option with the black gear button in the „Design center” menu. Transfer the selected items by clicking on the Export button. Transfer the ARCHLine.XP environment files by clicking on the Import button int he same menu. How to accelerate the join surface calculation? Join surface means you can specify the visibility of the common edges of two surfaces with the same texture property. 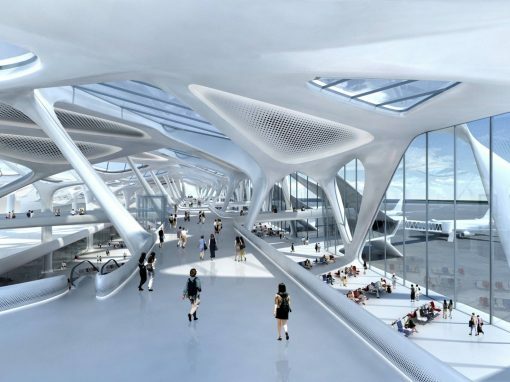 Join surface calculation for the entire 3D model can be a time consuming process. -When you change something that concerns the 3D model, the join surfaces calculation is not executed (the update of the 3D model is faster). -However, when you use the Redraw (Ctrl+R command) in the 3D view or you regenerate the entire 3D model, the join surfaces calculation is executed. How to restore the default interface? 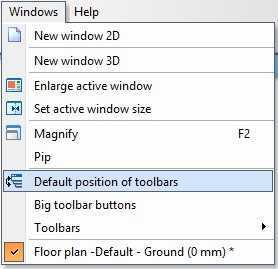 The Windows menu /Default Position of Toolbars command is a general interface cleaning command. It resets the interface to its default values. Use the Select tool to specify the entity or entities you will move later with Move or Move from commands. Click on an entity. The selected entity is highlighted and surrounded by small rectangles. If you need add more entities to the selection. The selection contains a center grip and two rotation grips. Note: Try to zoom in on your entity if you do not see the grips. 1. Click on the move command to begin the move operation. 2. Move the cursor to move the entity. The selected entity will follow the cursor. 1. Specify the reference point of the selected entity. 2. 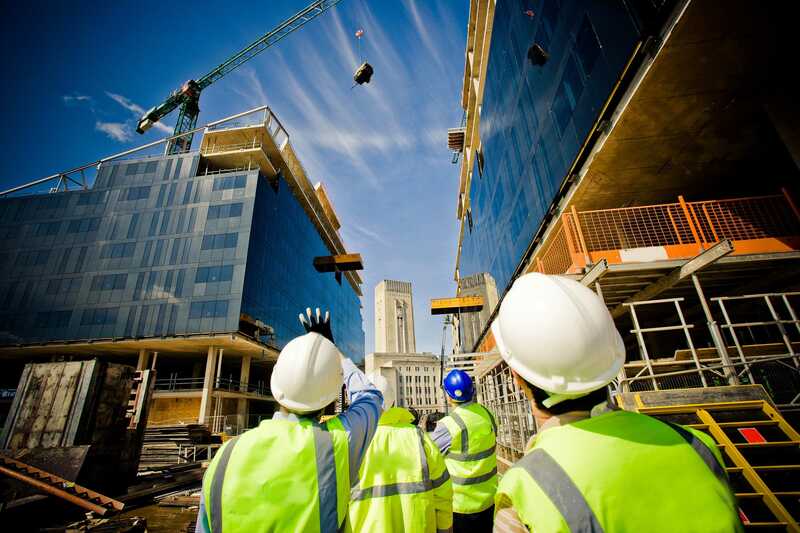 Specify the new place of the reference point. 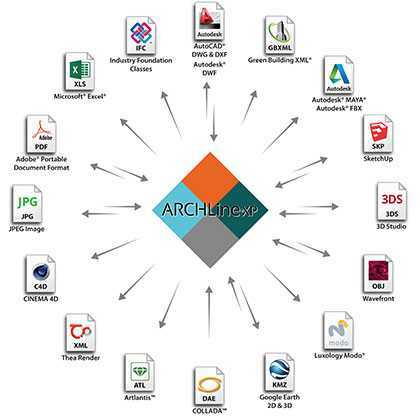 What kinds of files can I export from ARCHLine.XP? You can export several types of 2D and 3D files via File menu / Export. What kinds of files can I import into ARCHLine.XP? You can import several types of 2D and 3D files via File menu / Import. Direct distance entry enables you to draw a line, wall, etc. by pointing in a the required direction with the cursor and entering a distance. 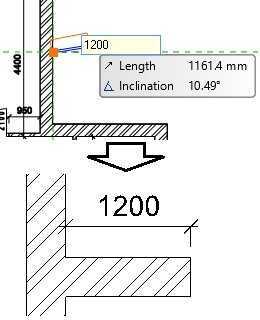 In this example, you will draw a horizontal line with a length of 1200 mm. Specify the first point for the line with a click. Move the cursor to the right of the first point. Try to keep the cursor line direction within a few degrees of the horizontal. Hold the cursor in this position and enter 1200 at the keyboard and press ENTER. The line or wall is drawn, 1200 mm long and in the direction you were pointing. 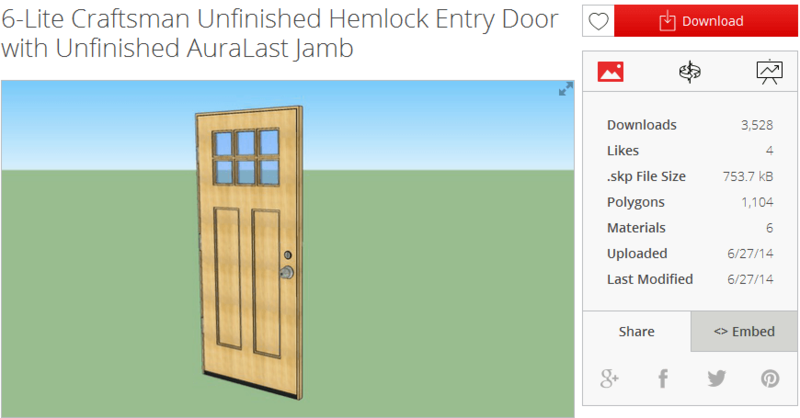 Any objects downloaded from 3D Warehouse or other web site can be converted to real door or window. Real door or window will be properly cut out from wall when you place it on your floor plan. The converted door or window is saved into the ARCHLine.XP libraries so you can use it later in any projects. Using this function it is possible to convert an object imported from 3D Warehouse Doors category to real door or window that can be properly placed into wall. Import object from 3D Warehouse. Place the object on the drawing then click with right mouse button on the object. Choose the Create door / window command. Relocate the 4 hotspots of the door/window on the left side by drag & drop, if necessary, according to reference drawing on the right side. Use the mouse wheel to zoom the door or window shape and locate the hotspot precisely. Choose the Door or Window category or type the type name and the new category name. Select the door from the library and place it into a wall. 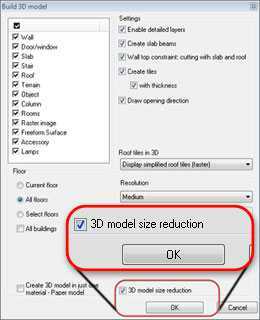 The 3D model size reduction option makes large 3D models easier to work with by automatically reducing the number of polygons. 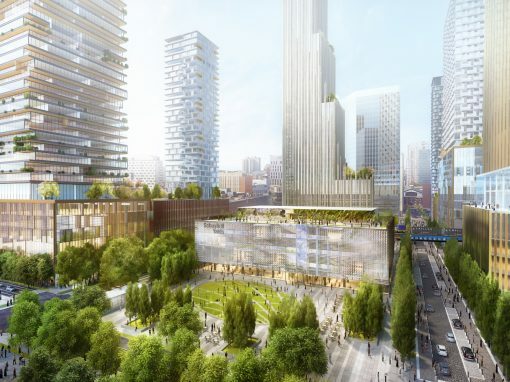 Using the process named decimation; the ARCHLine.XP eliminates polygons only where their absence will not greatly affect the model’s accuracy. The local geometry of the model’s surface is used to determine whether a vertex may be removed. When a vertex is removed, the ARCHLine.XP fills the resulting hole with larger polygons. Decimate never creates new vertices; the vertices of the new model are a subset of the original vertices. This approach preserves the model’s original structure, surface normal vectors (which indicates the model’s 3D orientation at each point) and texture mapping. 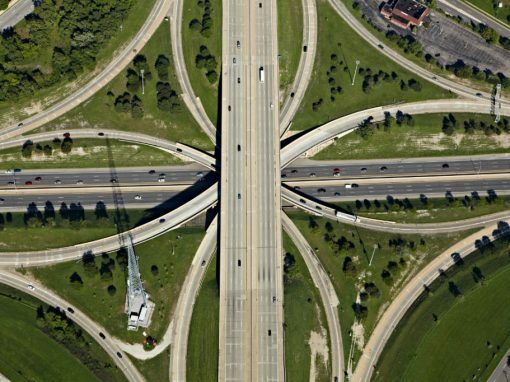 Reductions of up to 90 percent with only slight loss of detail are common. How to select all walls in a single step? 1. Move the cursor on the entity type main or any sub-icon in the toolbox, for example select: Wall. 2. Use the right click over the Toolbox icons then click on the Select Types command from its pop-up menu. The program will select all the required entities (in this example all the walls) on the actual floor plan. Check out the tutorial video here! How to use drag and drop to copy the selected Excel sheet into the ARCHline.XP drawing? Select in the Excel the cells which you want to copy. To place it on the ARCHLine.XP we will use the well-known way «drag-and-drop». Select the cells you want to copy and hover over the edge of the selection. When you see the cursor change to four arrows, press and hold down the mouse left button. Then, while holding down the mouse button, drag the selection to ARCHLine.XP drawing. 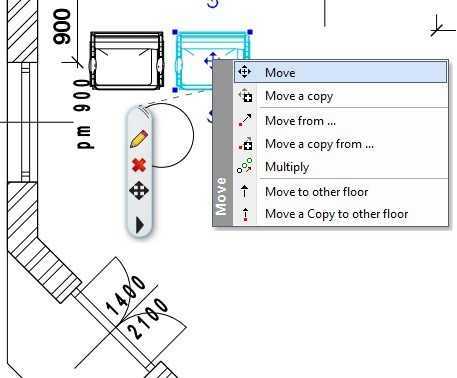 When you release the mouse the contents of the cells are copied as text on the drawing.